Barielle “Taste of Summer” Giveaway – Win a summer tote bag & more! 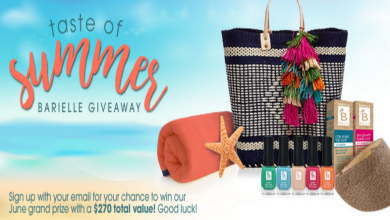 Win a summer tote bag with a Tommy Bahama beach towel & more! ENTER SWEEPSTAKES HERE – Barielle Facebook page. ENTRY LIMIT – Limit: you may enter once. ELIGIBILITY – This Sweepstakes is open to legal residents of the 50 United States and the District of Columbia who are 18 years of age or older (19 years of age or older if a resident of AL or NE). SWEEPSTAKES ENTRY PERIOD – The Sweepstakes begins at 9:00 AM EST on June 4, 2016 and ends at 11:59:59 pm EST on June 30, 2016. PRIZES – ONE GRAND PRIZE WINNER WILL BE AWARDED a PRIZE: One randomly chosen participant will win a prize.